Pop Heig, Thirty-Five Years in Charge of Home, Relates Story of 100,000 Charges. “Pop” Rudolph is going to quit. That is not all. “Mother” Heig has decided that she will have to leave with him, and as she is his wife it isn’t strange that she reached this conclusion. Of course the announcement doesn’t mean much to the ordinary New Yorker when there are other things to read about and he is not sure yet whether the Jeffries-Johnson fight is really going to take place or the Giants are beginning to get in better form. It is merely a little item sandwiched in among a lot of advertisements announcing that the Children’s Aid Society has accepted the resignations of Mr. and Mrs. Rudolph Heig as superintendent and matron, respectively, of the Newsboys’ Home, at No. 14 New Chambers street, and that some one else will be appointed to take their places. It doesn’t mean much to some, but it certainly does mean a whole lot to more than a hundred thousand boys and one girl who knew them as their friends, aids and advisers when every one else in the whole world was against them and the outlook for life was about as black as it can appear to the juvenile mind, which ought to be naturally optimistic. It doesn’t mean newsboys who regret their leaving, but it means newsboys, Governors of States and Territories, financiers and lawyers, who still regard the couple as the only persons in the country who took them in and befriended them when no one else thought them worth caring for. 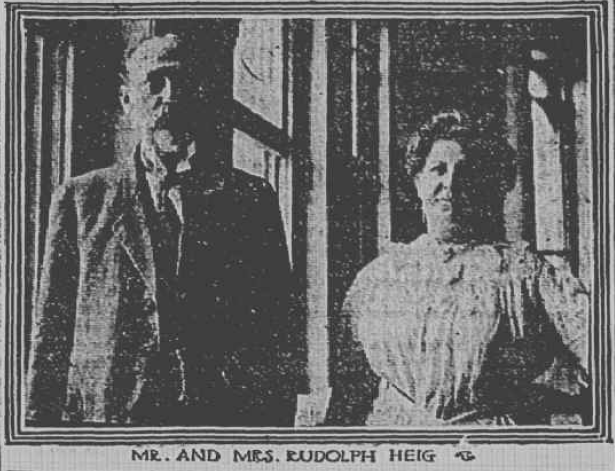 “Pop” Rudolph Heig didn’t make any fortune for himself and neither did his wife, known from coast to coast by thousands of boys as “Mother Heig.” but if the youngsters whom they have befriended and put on the right road since they first took charge of the Newsboy’s Home had their way they would have the first place in the hall of fame. Having started life as a newsboy himself there was no one whom the Children’s Aid Society could pick who was more eminently fitted for the place of superintendent of the home for the “newsies” when the home was opened in New Chambers street thirty-five years ago than Mr. Heig. At that time he was a youngster himself, having given up his selling papers in Park row to become office boy in the uptown office of the society and then clerk. He knew boys, and especially newsboys, as only a man who was one himself could know them. He was as well acquainted with their code of honor, division of districts and unwritten fraternal laws as they were themselves and he knew that a newsboy wasn’t to be treated with the same regulations that a youngster of the upper ten would expect. To be pampered and coaxed was disgusting to them, and to have any one start in “preaching” in a vernacular they didn’t know was something that any youngster who had to hustle for himself hated worst of all. Mr. Heig knew this. A reception is to be tendered Mr. and Mrs. Heig on Thursday night, which will be the last night they will spend in the old lodging house, and it is expected that their boys from all parts of the country will be present. In telling of his experience while superintendent of the home during thirty-five years Mr. Heig smiled when he related some of his experiences, and looked as proud as any father could of an only son instead of being foster father to a tenth of a million, when he told of the triumphs of some of the youngsters for whom he had cared. “A newsboys is just like any other boy,” he explained. “He’s a boy and has got to be treated like one. I’ve had more than a hundred thousand youngsters under my care since I’ve been here and neither my wife nor myself has ever struck one of them. The boys sometimes would a good deal rather that we would, for there is nothing that a youngster who has had to hustle for himself hates more than to be caught in wrongdoing or violating confidence or trust imposed in him, and hundreds of times they have told me that they deserved a licking and would be pleased to have me administer it. I’ve had as many as thirty-nine different nationalities in this lodging house in one night, including Chinese, negroes, Arabs and Egyptians, and never once has there been a fight between the boys while they were inside the building. They knew that it was against the rules and if they had any differences they settled them outside—perhaps on the doorstep—but the other boys would not allow any rules to be broken in here. “There was only one girl who ever came here and then we didn’t know that she was a girl. Her name was Josephine Beck and she came from Newark, N. J., early in the spring of 1904. She had put on her brother’s clothes and wanted to come here and make her fortune. The boys used to make fun of her when she talked and she got the nickname of “Sis.” Afterward we found out she was a runaway. “She was different from ‘Narrow Mike’. He was a youngster of Irish parents, who decided after he had been left and orphan and lived here for a while that if he was a girl he could sell more papers than a newsboy could. What does he do but buy a cheap outfit at some woman’s clothing place and for a couple of months used to leave here in boy’s cloths and then put on the girl’s dress in the vestibule and sell his papers dressed this way. It proved a success and it was several months before the other boys reported it to me. ‘Mike’ is now a lawyer in an up State city and I don’t think I out to mention his name. “Being forced to fight against the world as they are, my boys naturally learned to look out for themselves even before they came here. There was one youngster from the east side who used to come here years ago and was always the hardest worker of the lot. He was out before the others and sold papers until the rest had gone to bed. Sometimes I would sit on the edge of his bed and talk with him, or if it had been raining or snowing and he was cold my wife would bring him into our rooms and he would tell us how he was studying every chance he got and trying to make something of himself. “Well, he did succeed pretty well, but he didn’t leave the million dollars he was always talking of, for he was just as liberal and charitable with his money when he was a man as he was when he was a kid. He died a couple of months ago, and, while the papers called him Mr. Sullivan, he was always ‘Little Timmy’ to me and my wife, and there was seldom a month that he didn’t drop in to see us. “It was here that the name ‘Little Tim’ was first used, and it was his cousin, ‘Jerry’ Sullivan, who was also a newsboy and lived here at the time, who first called him by it. But ‘Timmy’ wasn’t the only newsboy who came from this old lodging house who made good. “Years ago there were two boys who sold papers in Park row and became fast friends. It was before my time when they were here, but they have told me the story themselves. One boy’s mother died when he was a kid and his father married again. That youngster’s name was ‘Johnny’ Burke, and here he met ‘Johnny’ Brady, and the two became fast friends and sold papers along the same streets. They were sent West by the society, and the next thing we heard of them was that they were getting along finely. I used to get letters from them to read to the boys of their work in the West, and when they visited this school the next time ‘Johnny’ Burke was the Governor of North Dakota and ‘Johnny’ Brady had been appointed the Governor of Alaska. That was pretty good for two of our boys, wasn’t it? “We charge a boy fifteen cents a day here, and that includes his bed, two meals and the privilege of the reading room and the gymnasium, and there is a separate locker for every boy. Of course that doesn’t pay expenses, and when a youngster comes here and hasn’t any money we forget about asking payments until he starts in. It puts a boy on his mettle to know that others pay and he doesn’t and we never had a boy yet who didn’t start in paying after he was here two days, and it was always his own idea, as we never suggest paying until he wants to. “There are some of the boys who want to save their money, too, and I take in all they give me until the sum has reached enough to open an account in the savings bank, and then I go with them to start them right. They are prouder of their bank books than a soldier of his medals. “Speaking of soldiers, within the last couple of years there have been more than twelve hundred boys who were old enough who have left here to join the army, and of that number there has never been one of them who has been tried for any breaking of the rules. That’s a pretty good record, I think, for my youngsters. “When any of the youngsters get sick here my wife takes care of them, unless it is something that is contagious or which needs the care of a nurse night and day; then we have them transferred to the hospitals and if possible either my wife or myself visit them every day. “I’ve been walking along the street many a time and had well dressed men stop me and while I didn’t know them they called me ‘Pop,’ and then I recognized them as one of my boys. Last fall there was a big touring car drove up to the door and a fashionably dressed man and woman got out. They came upstairs and asked if they might look over the building, and I took them myself. On the third floor dormitory we met my wife helping the boys clean up the rooms. Then for the first time the man spoke and taking her by the had he said ‘Mother Heig, I guess you forgot Skinny.’ Well, she didn’t and Skinny was now a bank president and the woman with him was his wife. He had to take his wife to the next room and show her his bed and then his locker. They were both crying when they left here and, well—my wife and I felt mighty happy to see another of our boys make good. “Of course, most of our boys are from the city, but there are lots of country boys who run away from home and drift in here. I can always tell a runaway boy when I see one and I know the signs of homesickness. “It’s my wife, however, that gets them to talk, and after they have been ‘mothered’ a little they will tell her everything, and we’ve talked to a good many of them and sent them home happy. One of the runaways we sent home is now a member of a college faculty, but he need not fear that we will ever tell anything about it. “There is one thing about a newsboys that most people don’t know, and that is their fraternity. Let a newsboy get ill or have some of his family taken down and there is not a youngster who will not give every cent he can afford to aid them. I have known hundreds of men and women who were saved from Potter’s Field through the chums of their children taking up a collection and with their pennies giving them a decent burial. They will always stand by each other in case of trouble, not matter how many fights they have at other times. “There was the time when ‘Swipes’ married ‘Little Minnie.’ He had to fight half a dozen boys older than himself, including ‘Yaller, the Butcher,’ but when two or three of them got together to stop him from getting married the other newsboys heard of the scheme, and there was a small army of them in City Hall Park to protect ‘Swipes’ and his prospective bride when the time came for the ceremony. They don’t forget the deans of their game, either, for when Henry L. Gassert, the first newsboy to shout ‘Extra!’ in this cit, died eight years ago they took up a collection and sent flowers, although he had stopped selling papers more than fifty before that. Mr. and Mrs. Heig will not leave the Children’s Aid Society altogether, but will take charge of one of the farms run by the organization. They have four children, all of whom have been born in the lodging house, the youngest being a high school graduate and the eldest now studying in New Haven. Asked as to why boys ran away from home and why they became newsboys, the superintendent smiled.